I'm Patrick Azzarello. I'm a Senior Program Manager on the Windows Ecosystem Fundamentals team. 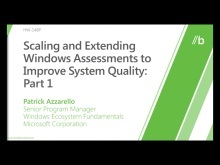 For Windows 8, I am working on the assessment framework. I enjoy music and time spent with my family.